Welcome to Certury star glass Mirror. We are one of leaders of mirror and mirror pads . 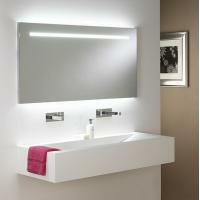 What we provide is on the design, manufacture and hand-finish all components of our LED mirrors. This allows us to ensure that every aspect of your mirror is on the highest standard production. Quality is at the heart of everything we do from our products to our customer service and is one of the reasons we're a leading name in the industry. We don't just build mirrors, however – we innovate all the times. such as Mirror with Tv, Bluetooth Speaker,Radio,Audio ,Digital clock,Shaver,magnification . So if you're looking for a stylish new addition to your bathroom, and you want quality guaranteed, welcome to contact us at any time. f.) Mirror Frame with aluminium aloy or Zinc alloy or iron. The back frame box will be steel if necessary. 2. Standard size: 700*500,600*600,600*800, 700*900,900*1200 mm, etc. Such as Frameless mirror 1000*800mm,we can make 1000*800 anti-fog pad size for fog free. 1. Sample packing : Foam projected in PE bag, carton box, outside wooden crates if necessary. 3. About the size and package of the junction box, we can produce as per your demand. When you read our website, you will be in the right choice, more details please fell free to contact at any time! !